Its been quite a while since I posted but here is one of the project I have almost completed! It was a bedroom dresser that sanded, striped, and beat the heck out of I then repainted (Green- soon to match my dining room!) 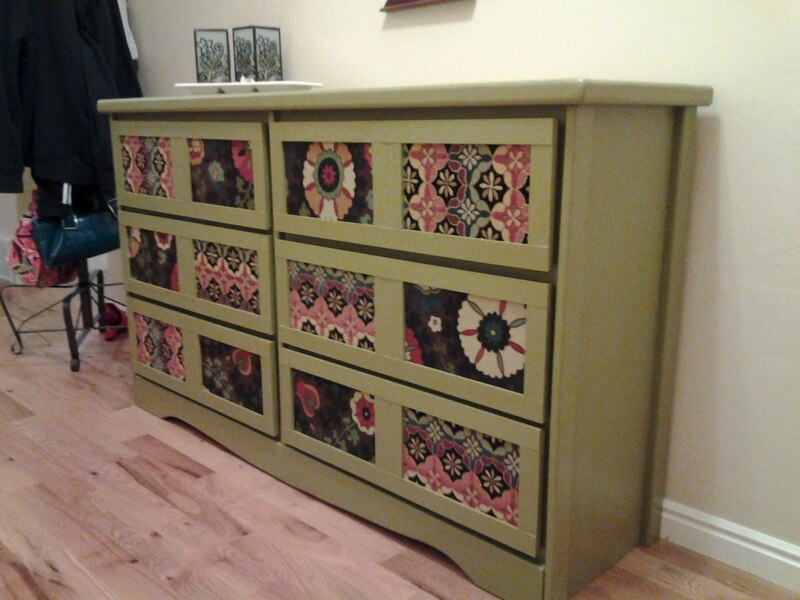 then flipped the drawer faces over and glued some cute home decor fabric as the panels. Next I got some 1-1/2" wood sticks and painted all of those. Here is where it got tricky... (only for my dad who only had a verbal description of what I was trying to accomplish!) 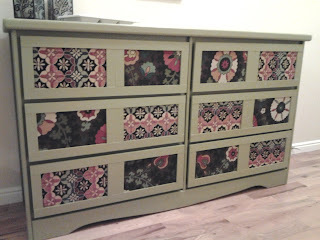 He took the painted sticks cut them down and nailed them around my fabric panels! (He did a great job!) I still need to glaze the cabinet but for now it looks pretty neat! I am so happy that it is finally warm, I can't wait to go for a walk and not get soggy and wet! Well the last few months I have been feeling pretty crappy every now and then I get this horrible stomach pain (always in the middle of the night!) So I finally made a doctor appt. to try to figure what in the heck is going on, at first they said nothing was wrong but then they did some other tests and decided that I wasn't crazy or making it up and I needed my gallbladder removed. So that is what I did last week! I feel so much better now, I can't even tell you! Now I just need to get my muscles and all that back up to par and I will feel like a new person. I had no idea how much you use your stomach muscles till this experience! I was never happier when I could sit up without Dallas' help! So a few more days of being lazy then its back to work. I actually miss being productive! When is the rain going to stop and when will we ever see the sun again? I hope soon, I am sick of being soggy! Well not much has been going on, we are starting to begin the large and overwhelming project that is our back yard! I am way excited but it is also way over my head. So if anybody has any great tips to transform the field that is my backyard I would love to hear them , also if anyone knows anyone who does stuff with landscaping or sprinklers or that stuff I would love references. I really don't want to do it myself! Also we are coming up on our anniversary!!! I can't believe it has been 8 yrs since we got married. It seams like time has flown! But I am continually reminded that forever is a lot longer! SO that is all for now, I will try to post better in the future! Wish me luck on that one!!! So I finally got around to putting some pictures on... This is my living room from the entry and then my kitchen. The dining area is right next to the kitchen but at this time I still did not have my table! After 9 weeks I now do have a table and we are in the process of finding bar stools. I can't wait to add more decorations now I have plenty of wall space to put them up! By the way if anyone needs our new address just leave your email and I will forward it on!!! Thanks! We got all moved in but I am still waiting for a kitchen table (a month and a half after I ordered it)... and I have not got everything unboxed... Not enough hours in a day! I have a new purse I am making... (Priorities, a new purse or unpack boxes???) and I am also making some new drapes for Grandma Randall's kitchen, (also I will post pictures when they are done!) So besides work and everything else, that is what I have been up to! I promise pictures are coming!